Bayern Munich striker Robert Lewandowski has been rewarded for his record-breaking exploits while on international duty by being named in the FIFA 18 Team of the Week, with his latest rating lifted to an overall 92 - behind only Cristiano Ronaldo and Lionel Messi. The 29-year-old became Poland's all-time top goalscorer with a hat-trick which also helped him to become the most prolific goalscorer in World Cup qualifying history with 16 strikes in ten appearances, smashing the previous European single-campaign record held by Predrag Mijatovic, who struck 14 for Yugoslavia in qualifying for the 1998 World Cup. It also bettered Real Madrid's Ronaldo, who netted 15 qualifying goals, and saw Lewandowksi's FIFA 18 rating boosted by a point. Poland booked their place at next summer's World Cup largely thanks to the Bayern Munich sharp-shooter's phenomenal form. 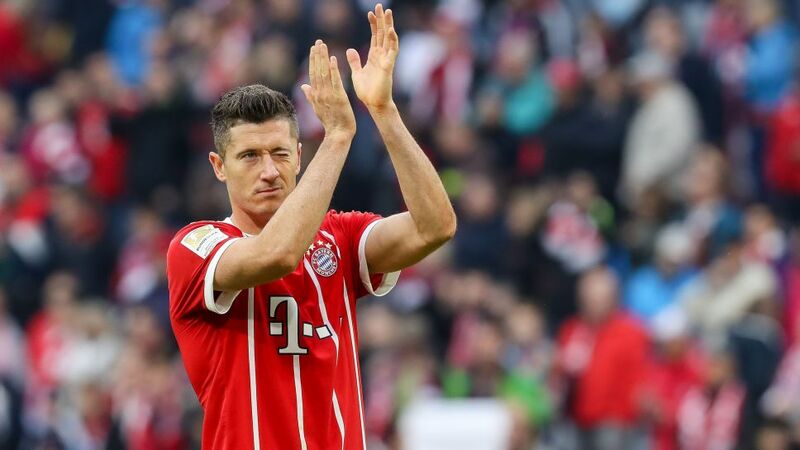 In the rankings, produced by EA Sports, Lewandowski has now joined his club mate Manuel Neuer among the top six players in the world. He was not the only Bundesliga player to feature in the team of the week, though. Sandro Wagner and Leon Goretzka's goals for Germany also earned them a place, while another Hoffenheim duo – Andrej Kramaric and Steven Zuber – made the reserves. Follow all the build-up to Jupp Heynckes' return as Bayern Munich coach this weekend here!